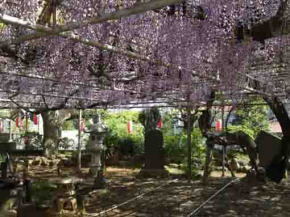 The noted wisteria garden in Ichikawa city is in Miyakubosan Koenji Temple. 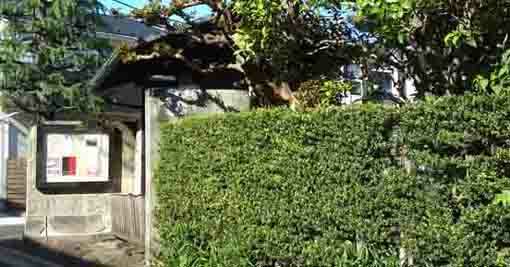 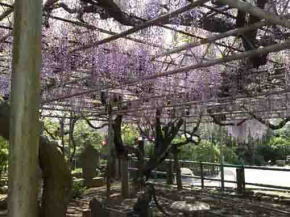 Koenji Temple is an old temple which has over 200 years old famous wisteria trees called Choju Fuji. 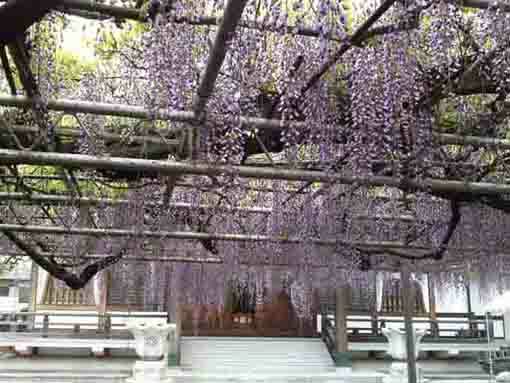 Passing through the main gate, you could look a large wisteria trellis and kawaii statues of the Seven Deities of Good Fortune. 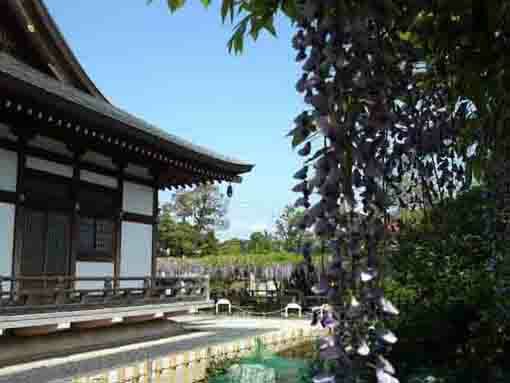 During the golden week (April 29 - May 5) in Japan, many visitors come to see the wisteria flowers around the trellis in the temple. 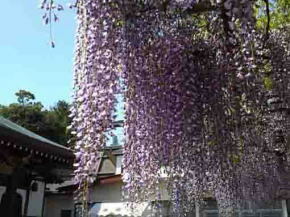 Why don't you visit to see wisteria flowers in Miyakubosan Koenji Temple? 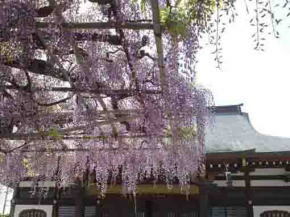 Miyakubosan Koenji Temple is very old, it was built in 1307, it first belonged to Shingon Sect in Buddhism, but it was converted to Nichiren Sect. 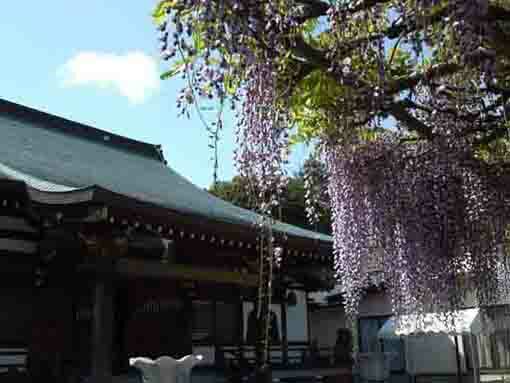 Koenji Temple is a branch temple of Nakayama Hokekyoji Temple, the grand head temple of Nichiren Sect at Ichikawa city. 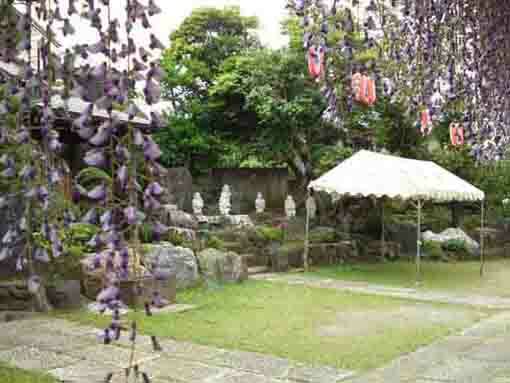 The venerable Nichigo was rebuilt the temple during Tenbun era (1532-1554). 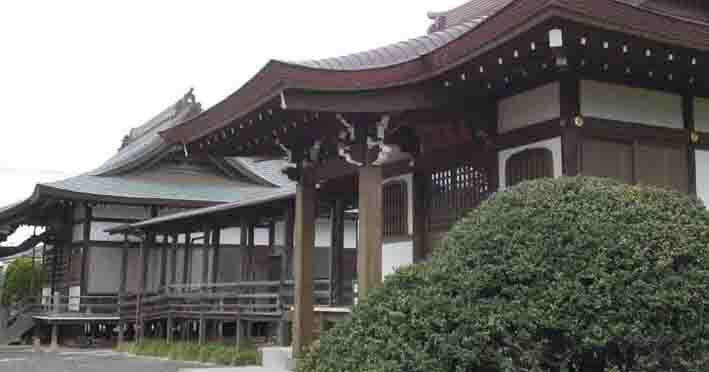 The main hall of this temple was built in 2000. 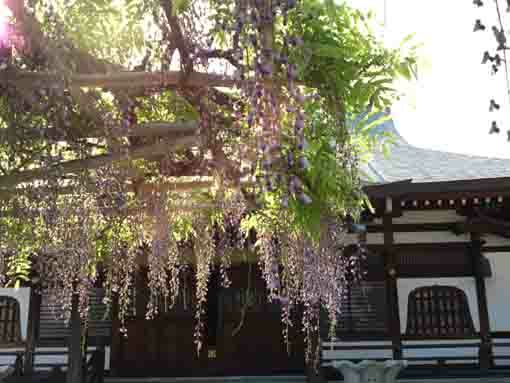 In the season when wisteria flowers fully bloom on the trellis, many visitors visit Koenji Temple. 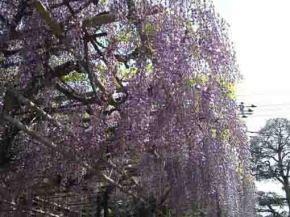 Choju Fuji was named by Chubei Suzuki, the ex-mayor of Ichikawa City as the tree has very long bunches, and also they are very long lived trees so they are over 200 years old trees. 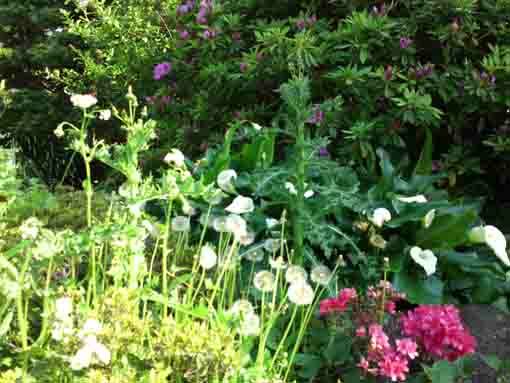 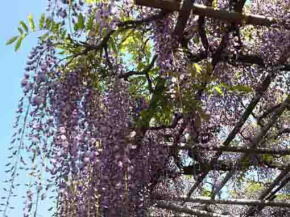 The bunches are usually 120 cm long, sometimes some of the bunches grow over 150 cm long. 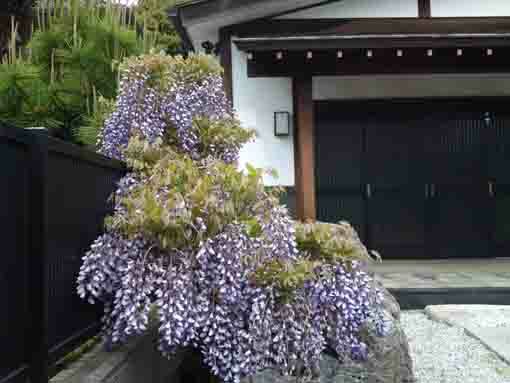 Choju Fuji belongs to Noda Fuji. 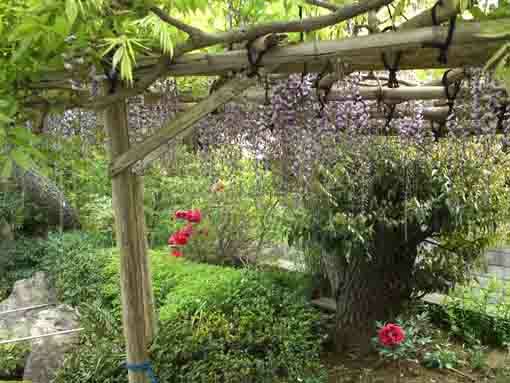 Choju Fuji has beautiful flowers fully blooming on the 100 square meter wide trellis. 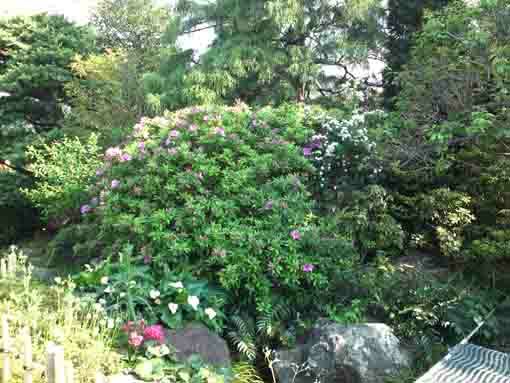 Miyakubosan Koenji Temple has a garden with a small pond between Choju Fuji and the parking. 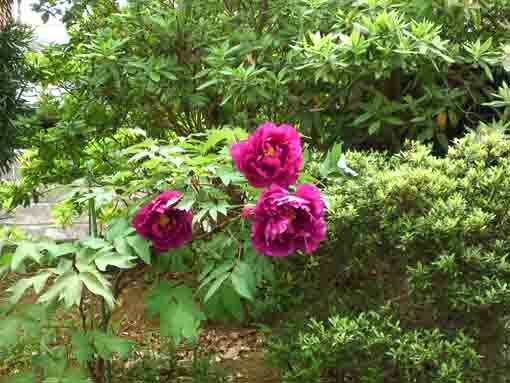 Anybody could find some beautiful peonies blooming when he or she who cannot wait for Choju Fuji with full blooming visits a little bit earlier than he or she has expected. 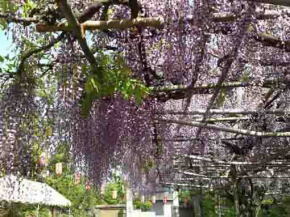 Moreover, there are two young wisterias planted on both side of the gate on the parking. 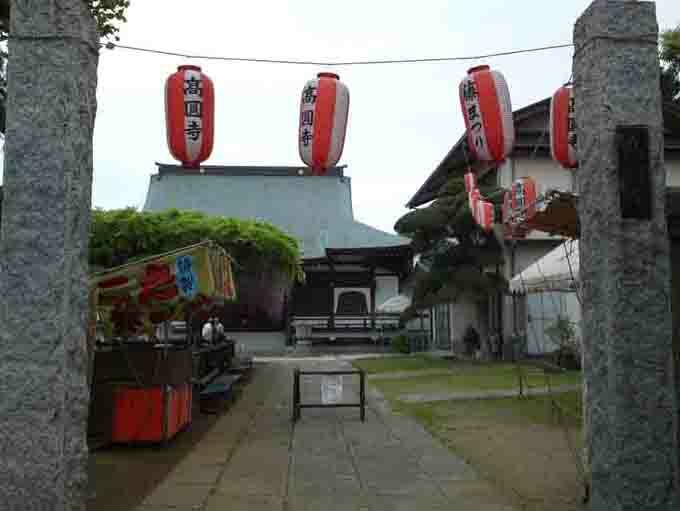 Shirahata Jinja Shrine has great accessibilities from both Narita and Haneda International Airport. 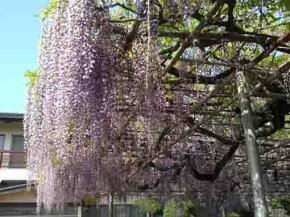 From Narita International Airport, take Keisei-line and get off Keisei Yawata Sta. 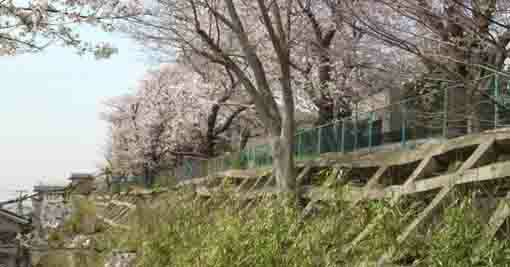 Take Narita Sky Access-line and get off Higashi Matsudo Sta. 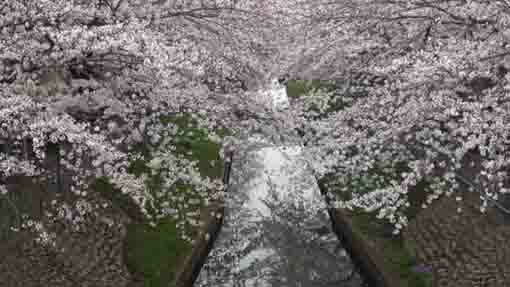 And also take JR Sobu-express line, transfer the line at Funabashi Sta to Sobu Local line, get off JR Motoyawata Sta. 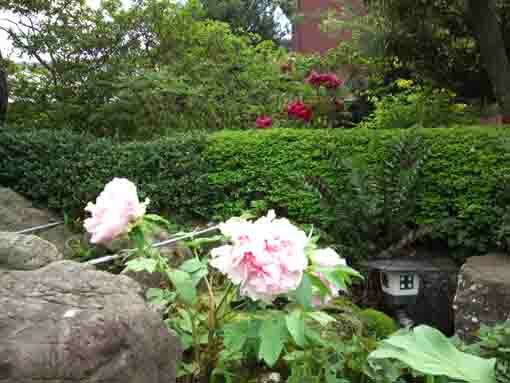 Take minimally 34 minutes from Narita Airport. 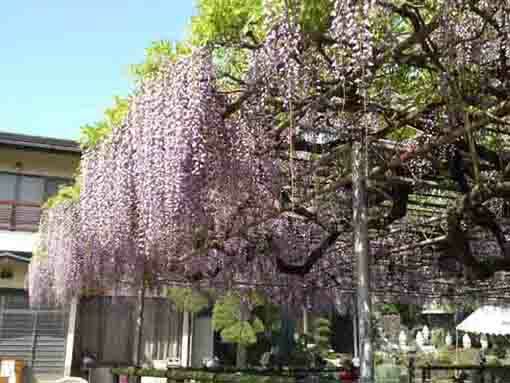 From Haneda International Airport, take Keikyu-line bound to Narita, and get off Keisei Yawata Sta. 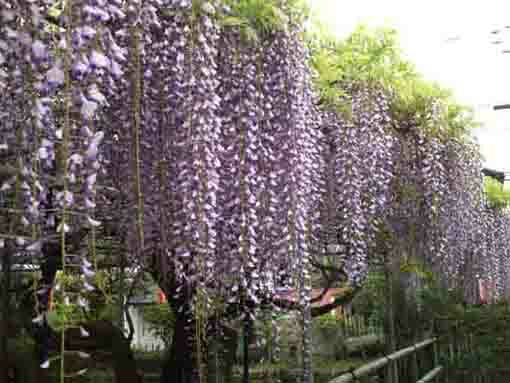 And also take Keikyu-line bound to Shinagawa, transfer the line at Shinagawa to Yokosuka-line bound to Chiba or Narita International Airport, transfer teh line at Ichikawa Sta to Sobu Local line bound to Tsudanuma, Chiba, get off JR Motoyawata Sta. 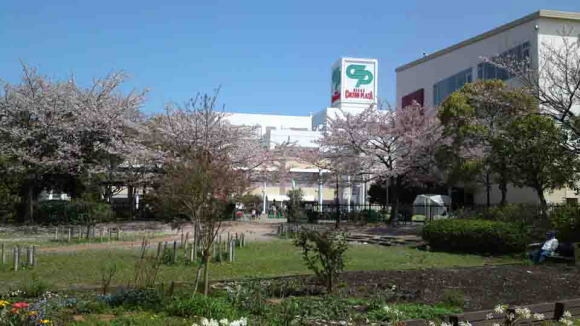 From Both Motoyawata and Keisei Yawata Sta, take Keisei Bus bound to Higashi Matsudo Sta, get off Miyakubo Sakashita or Miyakubo Sakaue bus stop. 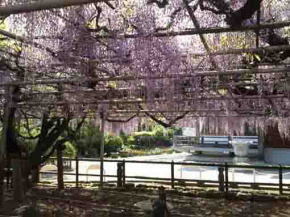 From Higashi Matsudo Sta, take Keisei Bus bound to Motoyawata Sta, get off Miyakubo Sakaue or Miyakubo Sakashita bus stop. 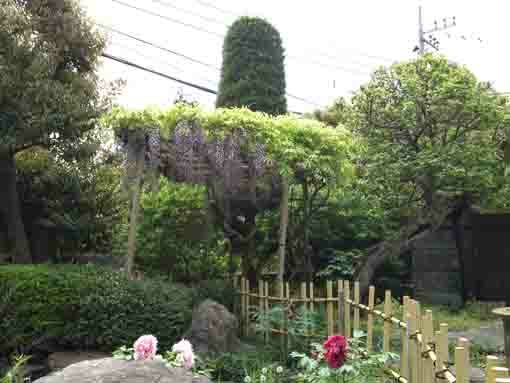 Take 6 minute walk from both Miyakubo Sakashita and Miyakubo Sakaue bus stops. 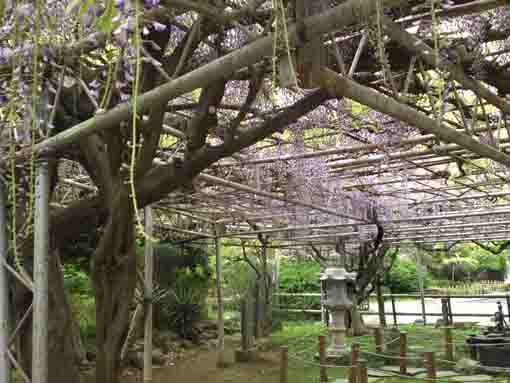 Having long history and the national natural treasure Senbon Icho Tree stands in. 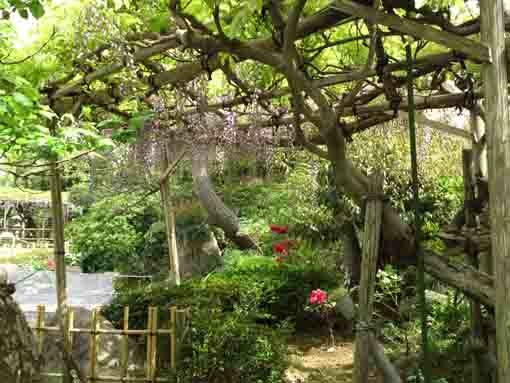 Having some legends in this tiny thicket, many writers introduced it in their masterpieces.. 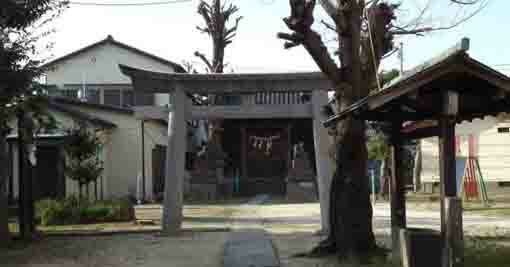 The shrine has monuments of Kafu Nagai, Rohan Koda and Kaishu Katsu. 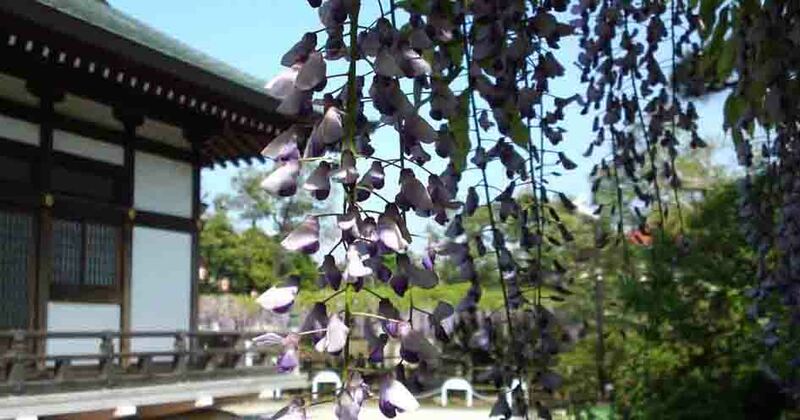 The noted wisteria trees called Choju Fuji are very popular and beautiful. 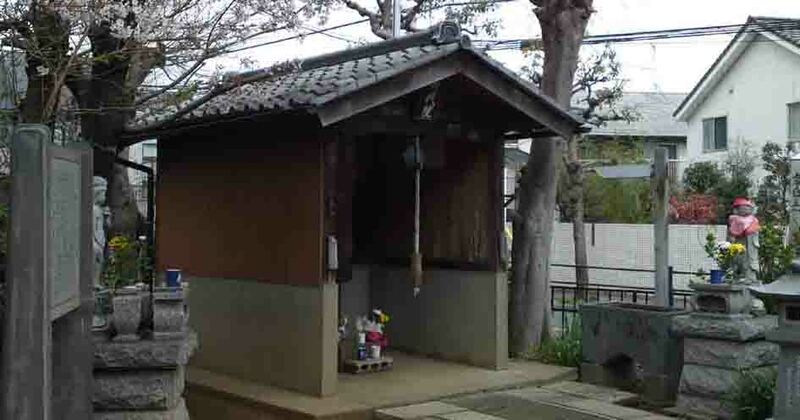 A small shrine standing quietly in residential area Sugano has some legends. 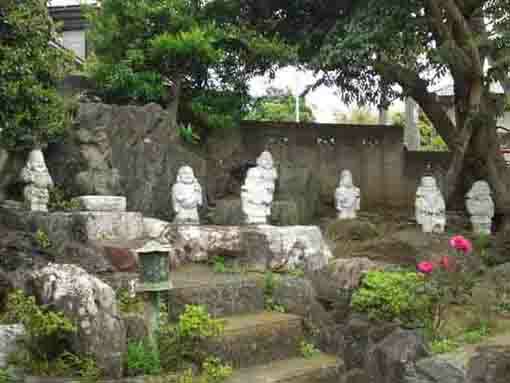 The statue of Myoken Bosatsu in it has been very famous since Edo period. 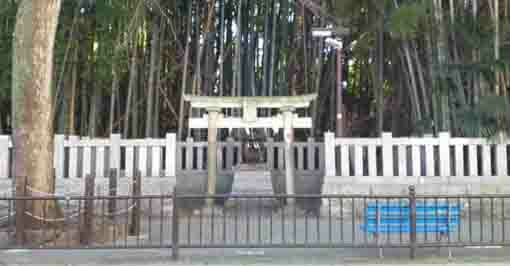 Kabuto Jinja Shiren has some legends about the Kabuto helmet dedicated at. 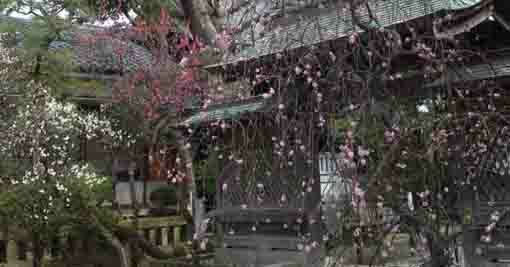 Yoko Mizuki was a scenario writer who contributed on the motion picture world in Japan. 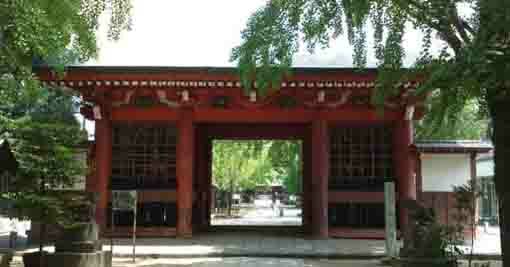 Shinmeisha Shrine and Shinmeiji Temple have their long history and the legend of Oguri Hangan.